Pots =/= people, and the same can be said for stone tools, but for what it's worth the Hoabinhian cultural complex associated with "group 1" genomes clustering with Onge and displaying South Asian affinities stretches to Nepal and Northeast India, but no further West. Its likely that Mesolithic South Asians have multiple layers of ancestry, and ASI may be obsolete as a clade by the time we are done. I do wonder if some of the really old specimens might come soon too ? I'm showing such plots since almost 1.5 year. ASI will be in the corner at the bottom of this triangle. Austroasiatic cline = ASI + Iran on the one side and ASI + proto-Austroasiatics on the other. I don't understand why so many people pushed for using Onge, Bonda or even Paniya as an ASI proxy. It just needs to take a quick look at G10 to see what the data really shows. C-Ydna from the oldest Hunter gatherer again :) . I don't understand the paper well, but it looks like ASI, like ANI, is a actually a combination of things. Onge probably reflects an SE Asian population related to Palaeolithic Indians. @Davidski, is it possible to use these samples and Onge to filter out the non-Onge/SEA hunter-gatherer component from South Asia? Is there a remnant that forms some kind of cline with Onge? Indians dont have any real Onge, it was apparent from the beginning that south asians and ASI is extremely distant from Onge and all andaman islanders so calling them related is false. I suspect racists wanted to make the false claim that indians used to look like Onge before ANI admixture but we know thats 100% false. @Nirjhar007 - "C-Ydna from the oldest Hunter gatherer again :)"
Interesting that the same is true for Europe. The first wave of AMH to break out of the Levant? Very interesting not-told story about East Asians (From Japan to Korea to China to Thailand). Looking at the Uyghur, it seems that most of the Southern admixture went North very recently, maybe some ~500 years ago. Now, about Southeast Asians, I don't think the Ancients of this study elucidate that much. "Indians dont have any real Onge, it was apparent from the beginning that south asians and ASI is extremely distant from Onge and all andaman islanders so calling them related is false"
The Onge were only used due to a PCA device, for the lack of ASI, they did a very nice job. "I suspect racists wanted to make the false claim that indians used to look like Onge before ANI admixture but we know thats 100% false." Aren't you the one here being racist against the Onge? Again, people used the Onge because that was the best proxy to use, and no one can affirm nor deny that the ASI didn't look like the Onge. Genetics isn't only about looks, Africans and Negritos look very much alike but no other groups have so much of a genetic distance from one another than themselves. Yes, you stand correct. It's okay to assume the ASI being in this position here? wrong, we can definitely confirm that ”Pure” ASI never looked anything like Onge since the tribals with the highest ASI dont resemble them, and the oldest human remains in south asia ie balangoda man dont look similar to them based on anthropological measurements either. And now since we know there is no genetic relationship between them either, we can establish that they didnt look like onge, otherwise you could make a similar argument without evidence and claim Yamnaya or paleolthic europeans looked like Onge. Perhaps Rob doesn't know about the Doric invasions? The Mycenaeans were the offspring of only the first wave. "wrong, we can definitely confirm that ”Pure” ASI never looked anything like Onge since the tribals with the highest ASI dont resemble them"
This here doesn't matter. Phenotypes aren't dependent of %share, but much more of sexual selection. That's why you can have Blue eyed blonde South Asians, who look very much like Europeans, but with only a small fraction of such ancestry. "and the oldest human remains in south asia ie balangoda man dont look similar to them based on anthropological measurements either." Also doesn't matter because of standard deviations and lack of a pool. "And now since we know there is no genetic relationship between them either"
We don't know that, we don't have ASI genomes. If anything, they do share a history in the past based on what's shown in this study. "we can establish that they didnt look like onge"
We cannot affirm nor deny that. "otherwise you could make a similar argument without evidence and claim Yamnaya or paleolthic europeans looked like Onge." But you can make this argument. Certainly. Bronze "I suspect racists wanted to make the false claim that indians used to look like Onge"
What would be racist about that? Unless of course you hold negative views about the Onge and their physical appearance. Personally, I gravitate towards the view that during the Mesolithic era, India was likely to be home to populations of mixed ENA-West Eurasian ancestry, while South Central Asia was inhabited by populations which were essentially West Eurasian (basically, the same situation we see today). With regard to the samples in this paper, I do see hints of a deconstruction of the ASI concept. Just as ANI was never a real phenomenon (but rather an abstraction, based on the confluence of ANE-related, Iran_N-related, and Steppe_MLBA-related streams of ancestry, with varying clines of these sorts of ancestry stretching from Tajikistan/Afghanistan/Northern Pakistan all the way to southern India), ASI will be shown to represent differential waves from Southeast Asia. Looking at the bigger picture, in a genetic sense India proper is a meeting point for ancestral streams emanating from South Central Asia and Southeast Asia. Anyway, it will be fun to see how these samples work for all those populations which tend to show percentages of Indian-modal ENA (Iranians, South Central Asians, and obviosly South Asians). Regardless, I think these samples go a long way in clarifying deeper phylogenetic history for ENA populations. I mean, East Asians as a mix of sister groups to Onge/Group 1 and Tianyuan! You have no idea what you're talking about. All statistical analysis shows the Onge as the best modern representative of ASI. Maybe read papers on the issue or learn to run analysis before making assertions. You can't expect the Paniya to resemble "Negrito" peoples, since they are 30%-40% West Eurasian, and 30%-40% admixture is enough to create a noticeable amount of phenotypic divergence. Interestingly, there were people in southern India who resembled the Onge. If I'm not mistaken, they were/are known as the Kadar. Most of them had Negrito/Papuan/African hair texture, no facial/body hair, Negrito facial features, etc. Not sure if the community still exists (even in the late 19th century, they were in the process of being absorbed by neighboring communities, and had a history of receiving admixture from neighbors). @David... can you provide the Global 25 coordinates for female I1392 from France? She is a very early Bell Beaker from the French/German border and contains no steppe ancestry. She is likely a good proxy for the Copper Age French population that that interacted with Swiss and German Corded Ware. People really aren't reading the paper too carefully man. 1) Now we do know that an Onge-like population lived all across Sundaland, including into Vietnam, prior to Neolithic intrusions. 2) The first Southeast Asian farmers most resembled the Austro-asiatic speaking H'tin and Mlabri hunter-gatherers living in Thailand and Laos, surrounded on all sides by agricultural Thai/Lao-speakers. Also they contributed to the ancestry of Orang Asli Hunter-gatherers speaking Aslian (also AuAs) in the Malay peninsula, and form a ~50% genetic substrate across all of Sumatra, Malaysia, Borneo, Java and Bali. Cambodians are >50% this ancestry pool. 3) Austronesians came down south into island Southeast Asia, probably via island-hopping from Phillipines which we know since Lipson 2014. The distribution is very uneven, some groups (e.g. Mentawai islanders off Sumatra) are almost 100% Austronesian, but the population of the larger islands are at most 50% Austronesian and 50% First Southeast Asian Farmer and some isolated groups like Bidayuh in Borneo still have first Southeast Asian Farmer ancestry dominating. 4) Iron Age Thailand genomes receive 50% ancestry from Sino-tibetan-like East Asians on top of first farmer ancestry and cluster among present-day Mainland Southeast Asian Austroasiatics like Mon, Lawa, Plang, Palaung etc. Great as we know Mon-Khmer people used to dominate whole of MSEA. 5) Bronze Age Vietnamese genomes receive 50% ancestry from a group like Tai-Kradai Zhuang in China (which are 50% Hmong-like and 50% Austronesian-like) and cluster among present-day Thai and Lao and Daic hill tribes. So there was a genomic shift in Vietman in Bronze Age but the Austroasiatic language (Vietic) persisted, and we get a Tai-like genetic contribution in BA Vietnam 1000 years prior to the actual Tai migrations into MSEA. So we know that the earliest linguistic layer in Southeast Asia is likely to be the Austroasiatics, and MSEA is distinguished by large number of introgressions onto the First Farmer substrate that still doesn't change the AuAs language affiliation, e.g. East Asian ancestry into the (Mon, Lawa, Wa, Plang, Palaung) group and Tai ancestry into Vietics. The Hoabinhian ultimately has a genesis in S China and moved South and West, so its possible that Onge-like ancestry reached India on top of some HG groups that were already there. Certainly there are some uniparentals, like Haplogroup H, that are inconsistent with an 100% Hoabinhian-Onge derivation of South Asian HGs. That said we shouldn't understate the sharing between these Hoabinhian HGs and South Asians, if anything they share more drift with South Asians than Onge. "Likely some "impossible" ancestry may be thrown our way, like for the North African HGs (which are equidistant between WHG and Yoruba, not possible really by the conventional understanding of the African-Eurasian split)"
Certainly; in fact, we may find some ancestry which has a specific relation to the non-basal streams seen in Iran_Hotu/Iran_N (and to a lesser extent, CHG). What I said previously is true and you guys are wrong, there was a measurement from a previous study that showed the genetic distance (number of generations separated) between onge and ASI was almost as distant as between west eurasians and east eurasians. So the only reason people make the stupid claim that ASI and onge is related is because No other currently living or studied cluster/population is as close, but thats just because Onge has been isolated for extremely long and most of its close relatives where wiped out/replaced. So its quite obvious the original pure ASI did not resemble Onge/andaman islanders phenotypically. End of story. Basu et al 2016 give ANI ancestry of 97.9% in North Indian Khatris with ~1.5% ASI. Why does their model give such low ASI? Thanks. "What I said previously is true and you guys are wrong, there was a measurement from a previous study that showed the genetic distance (number of generations separated) between onge and ASI was almost as distant as between west eurasians and east eurasians." @SeinundzeitInterestingly, there were people in southern India who resembled the Onge. I don't understand why Bronze is so horrified and disgusted by the Onge that he calls people who imply a relationship "racists". I think some look quite nice. Nothing you said matters, the genetic distance between Modern Europeans and WHG is immense, the same as Modern Europeans compared to the Chinese, and this doesn't make the story any less true. "So its quite obvious the original pure ASI did not resemble Onge/andaman islanders phenotypically. End of story." I do know one undated skull from Sri Lanka in W.W. Howell's collection had an Australoid appearance. He went so far as to remark in his notes: "Looks just like an Australian aborigine." Based on the way modern ASI-heavy people look, I wouldn't be surprised if "pure" ASIs looked similar to Australo-Melanesians. The Onge have a distinctive appearance all their own, but a lot of time has passed since the Mesolithic. Selection might have acted strongly on their appearance since that time. The authors of the new study point out that the Hoabinhian from the Pha Faen site in Laos was relatively tall (176 cm, which is about 5'9"). Obviously the Onge are much shorter than that. In any case, I would never be so foolish as to unequivocally declare that ASI did not resemble Onge. The Negritos continue to surprise in every new study in which they're featured. "I don't understand why Bronze is so horrified and disgusted by the Onge..."
Well, probably because he is racist... not much we can do about that. Too much importance is given to phenotype. Far more than it deserves. I don't understand the bronze's problem with the ASI resembling andamanese islanders. However I don't think it is true that the andamanese, SE asian'negritos', melanesians etc. all lool the same (unless one believes that all dark skinned people look alike. ), The ASI probably had physical features in common with peoples to the east but were likely unique looking in other ways as well. You're wrong, and misinterpreting research. You are probably referencing Metspalu et al 2011, which found a South Asian ADMIXTURE component that is equidistant between West and East Eurasians. But thats an ADMIXTURE component, not an actual ancient population. Unless you think that South Indian Dravidian tribals like Irula are unmixed mesolithic descendants and thus represent "ASI". They don't. The ASI-ANI model still stands, and is very robust. Here are the facts. There is a cline on PCA between Kalash and Irula on which all Indians fall, with Kalash pointing at Europeans and Irula pointing in the general direction of East and Southeast Asians plus Oceanians (the Onge are close to being at the end of the cline like how Europeans are at the Kalash end, but are somewhat offset as Arza shows). Relatedness to West Eurasians declines. Relatedness to East and Southeast Asians and Oceanians increases. Relatedness to Onge increases compared to Dai. Relatedness to Onge increases compared to Papuan. Tell me, how can you explain this without an Onge-like contribution in ASI? qpGraph tells us that ASI split off almost immediately after Onge and East Asians split. East Asians look nothing like Onge today, so why should we expect South Asians with high ASI to look like Onge? Reich et al 2009 has been cited hundreds and hundreds of times, they were the ones who introduced things like f4 stats and f4-ratio estimation. People who wanna talk abt S Asian genetics should familiarise themselves with the basic issues that need explaining. The likes of Moorjani, Thangaraj and so on are still referencing it. What you said is all good, but I don't think the Onge influenced in the ASI - it looks like much more to be the case where the ASI and Onge had a recent common ancestor, and that they plot close/have similarities because of that, not because of flow to one population from another. You were spot on with your images. The ASI in my mind looks like the first photo, but a little less rugged, maybe. What are your thoughts on the modelling of East Asians as Onge-related and Tianyuan-related? You might want to check out the Khonda_Dora genomes in the SGDP dataset in this paper, if their plotting position on PCA is accurate they might be one of the most extremely ASI populations ever found, much more ASI than even Irula. There's a Khonda_Dora individual from the SGDP in the Global25 datasheet. To go back to Mats comment- are you in fact one of the authors ? everything I said matters, its fact. ASI did not look anything like Onge and is not related to them in any meaningful way. deal with it. Yep its quite obvious pure ASI is more similar and related to australoids in a greater sense even though the genetic distance makes it appropriate to give ASI its own classification, maybe veddoid. Probably similar to certain australoids but not the same in appearance given how asi heavy south asians look. Well, it doesn't matter, and you have run out of arguments, everyone here already explained why you're wrong, if you didn't understand by now, then you're just a waste of time. No im correct. Youre wrong. Im talking about a graph which came from an relatively old study which showed the branching between ASI and Onge, I dont have time to look it up now but I remember it clearly, and the time depth since the branching time elapsed of Onge and ASI was almost as large as between east and west eurasians. Onge likely just represents some heavily drifted and isolated population that isnt closely related to anything else other than other negritos and south east asians to a lesser extent, which this new study supports with the genetic tests. No, you lost the debate since you didnt counter my argument with anything legitimate. So its you and the others who agreed with you who are wrong and wasting the time of others. ASI did not look like Onge and is not related to Onge in any meaningful way. Fact. Oh my guess would have been you were, given you Segwayed your previous predictions with the abstract of the paper on AG. But thanks for the summaries nonetheless- very useful ! Statistical analysis says you're wrong. Deal with it and piss off. You're a distraction from meaningful conversation. Why don't you pull out the study eh? Lets look at what it actually says. There are more and more incompatibilities, e.g. we "knew" that East Asians could be ANE + Onge, and now (with a very similar set of outgroups!) we "know" that East Asians are Tianyuan + Onge (Maybe because of the Tianyuan ---> Goyet thing?? Grasping at straws). We also "knew" that Onge and East Asians form a clade to the exclusion of Papuan but then we got a trifurcation, and now we have this. Maybe we need a "total qpgraph" or "consensus qpgraph" with extreme amounts of reticulation, like what Chad was working on, and every time new genomes come out, once we are confident some subset of genomes form a clade (e.g. >0.99 correlation in outgroup f3 with all other populations) we keep adding metapopulations to this huge, unwieldy thing to reflect some kind of big pic consensus opinion. No it doesnt, it proves me correct and proves you wrong. Piss off yourself. So what do we think this suggests for what Mesolithic India might look like ? Well, you're a visual thinker probably, you were comparing the length of the lines weren't you? ASI and Andamanese share (28.6/32) = 89% of the shared drift that ANI and CEU have with each other. Gotta read the numbers my man. This Khonda_Dora genome is interesting. Only shows 0.04% Iran_N admix in the Global25, and is preferred as the ASI proxy by all South and South Central Asian pops that I tried, over Onge, Dai, Han, Tianyuan, you name it. btw mike what do you have to say about this piece of info regarding the physical characteristics of mesolithic south asians? ”People from the Gangetic plains sites of Sarai Nahar Rai and Mahadaha were described by Oakley as looking like European Cro-Magnon skeletons, and by Kennedy as resembling other Mesolithic South Asians and Eurasians. Kenedy states that apart from the chin the mandibles resemble the Heidelberg and Ternefine (Tighenif) mandibles. "2,000 gens ago Split of ANI and ASI ancestors, 1,700 gens ago Split of Asian populations (‘proto-East Asia’, ASI, and Onge)"
So regardless how you try to spin it, ASI is extremely distant from Onge, so I was correct from the beginning. Also, CEU and ANI have not been isolated and drifted like Onge has, which speaks even stronger in my favor. From the mtDNA poin-of-view, there is a difference between India and Southeast Asia that mirrors the earliest settlement patterns. R is the oldest haplogroup in India. The age of R30 and R31 in India is c. 60 kya while the the age of R22 and R24 is only c. 39 kya and 23 kya in Jehai Negritos and Senoi in Malesia. While R is the oldest haplogroup in India, M is older in Southeast Asia and Oceania than in India. Age of mtDNA M in South Asia 40.2 kya, in East Asia c. 52 - 55 kya, in Southeast Asia 60.7 kya and in Oceania 68.3 kya. The both huntergatherers in this new paper carried M haplogroups: Hoabinhian hg Pha Faen Laos, La368 calibr. date 7888, M5 and Hoabinhian Phase 1 Gua Cha Malesia, Ma911, calibr. date 4319 M21b1a. M5 is today found in Orissa, India, in particular in Chenchu and Koya (25%). M21 is the typical haplogroup of West Malaysia's Orang Asli, Semang and Batak, Senoi, Abor. Malay and Jehai. Therefore, the oldest settlers in India may have been carriers of mtDNA R and yDNA H (?) and they were probably autosomally diffferent from the southeast Asian huntergatherers. Then, at some point, M started flowing to India and brought India and Southeast Asia autosomally closer to each other. You obviously have no idea how to read scientific literature, first looking at lines in the picture and now this. Sounds accurate, good stuff and I agree completely. No, but Gond is up to 25% more West Eurasian and something ANE-like than Khonda_Dora. So ASI is just Khonda_Dora with minor ANE-related ancestry. Last thing, isolation and drift is not something that affects the *phylogenetic* relatedness of populations. Some South American hunter-gatherer groups are so isolated and drifted that the fst between them are some of the largest on Earth. Same for many groups of European hunter gatherers. Bowing out, its a waste of time to talk to you really. Its you who are dumb, listen to yourself, In that very same post you claimed that ”east asians papuans and Onge are all meaningfully related” which shows you are completely lost as to what you are talking about. Those groups you mentioned are not reöated in any meaningful way other than determining huma migration patters after OOA. They are genetically extremely distant from each other and look completely different, just like how ASI and Onge are extremely distant in phenotype and genetic distance. You obviously have a very different view sbout what a ”meaningful relation” is, which is hilarious that you dont see how much you are reaching with that perspective, especially since we are discussing phenotypes here. Yeah bow out, you lost the debate, ASI and Onge are not meaningfully related when discussing phenotype considering the timegap of branching and genetic distance is extremely large between them, none of the ancient human skeletal remains in south asia even resemble Onge and modern south asians do not resemble them either. So what I said from the beginning was true. Spanked: I don't understand why Bronze is so horrified and disgusted by the Onge that he calls people who imply a relationship "racists". I think some look quite nice. Yeah, not sure about the "racists want ASI to look like Onge", as why they would want that as opposed to an equally small people (which is the overwhelming likelihood based on West Eurasian->ANI->ASI stature clines), who were still highly adapted to the tropics (dark skin, broad nasal aperture) who just cranially looked more like Australian Aborigines or Papuans (more robust). (Whatever disputes about likely phenotype, the ASI (pre-Neolithic) were likely extremely short, extremely dark, extremely broad featured, beyond any present day populations, whether they had a more gracile cranial phenotype on top of that like the Onge or were more robust like Oceanians. Almost everything from present day information on populations from hot climates and our knowledge of clines of phenotype in India today supports this). Why East Asian shifted population without (or with a small) Iran_N admixture is a better proxy than Iran_N shifted population without East Asian admixture? Why the total lack of Iran_N is required to be a good ASI proxy? Thanks for that. What is the hypothesis on the route taken by MtDna M from Africa to Oceania? Or did it not originate in Africa? I do not believe in the origin of mtDNA M in Africa but this opinion of mine is not a proven fact. There is a chapter about M1 in the paper I referred to in my comment: "About the origin of the North African haplogroup M1"
It may be worth noting that Onge share no more with the Hoabinhian group (Group1) by f3 than they do with any of ancient groups that look East Asian. Onge only high sharing with Group1 relative to what East Asians have with each other; Group1 not high with Onge compared to other groups. I'm somewhat unsure of how that is explained if Group 1 is a clade with Onge. (Opposed to "ENA" groups that went a separate way). Language groups can be quite diverse in affinity to the remaining East Asian ancient groups. The overall levels of Yoruba outgroup f3 for the "ancient East Asians" do seem quite high for many of these populations compared with West Eurasian ancients->modern. This is probably consistent with lower diversity therefore more sharing in ancient East than West Eurasia, with a similar impact of the pooling of diversity from structured populations with Neolithic->Metal Ages->Recent transitions? @Ryu, thanks for the summary also (I did read through the paper but the focus is slightly different at times, so your comment brings some other things into focus). Wrong, its not an overwhelming likelyhood at all that ASI where extremely small, look in the comments above where the current ancient skeletal remains are described. And that ASI where extremely dark and had extremely broad features is not likely either, most likely they had very diverse facial features but more on the robust side and a varying range of brown skin. Not darker than that ancient briton that was revealed recently, and certainly not as dark as Onge. I hardly had time to look at the paper in detail, but I thought I'd share this experiment I did before. It uses an ASI ghost which is basically a straight line through the SC Asian cline on Global 25. And then I used the same setup as in Lazaridis 2016 for all the SC Asian populations (Onge + Han + Iran_LN + EHG, and the ASI ghost). The point was to see in which direction each population went in their ENA component (the West Eurasian side is irrelevant here, just used the most simple setup that works and is backed by literature). Austroasiatics clearly deviate, not just towards Han, but mostly towards Onge. While most Indo-Aryan and Dravidian populations stick to the ASI ghost (Pulliyar and Paniya being Onge-shifted, as noted by Arza). A "pure ASI" would be beyond any of the averages on the list I've linked above. E.g. assume "Caste" has 40% ASI and stature 165cm, and "Scheduled Tribe" has 60% and stature 159.75 and ASI is then estimated 150cm (if you assume "Caste" 30% ASI and "Scheduled Tribe" 70%, then the 100% ASI 152). Andaman Islands estimate is about 148cm there. Small stature makes sense, following Bergmann's Rule (though there have been exceptions). Unless anyone's totally obsessed with whether the ASI were 1 inch or 2 inches taller than the Onge, or exactly the same height, or whether they're ten "melanin units" lighter and so have a very, very dark brown tone rather than a cool blue-black look there doesn't seem much to debate (and there's barely any genetic angle in doing so). (no more comments after this replying to you, you're not winning arguments here. you're ignoring what others say and then declaring you've won. what's the point of debating with such a person? and this kind of debate about physical characters can become very bad for reputation on comments on here unless it is conducted rationally). Thats a really bad argument, considering the fact that there are african americans (who are on average 15% european) with just as wide or wider noses compared to ”pure” africans in sub saharan africa. The cline in India of the various sub populations is not only affected by ASI, also austro-asiatic affect certain populations in south asia more or less, so you cant just make sn assumption that pure ASI has wider noses compared to these varying populationd when they have many different components that ASI didnt have. Same thing applies to skin color, ASI where not even close to as dark as Onge. Youre also wrong about height, we are not talking about one or two inches difference but the fact that ASI where much taller than Onge or any kind of negrito, as dsiplayed by mesolithic remains in South asia. Ive won every argument here in the comment section, and this is no different, you lost as well and you ignored the facts I mentioned. get over it. "(no more comments after this replying to you, you're not winning arguments here. you're ignoring what others say and then declaring you've won. what's the point of debating with such a person? and this kind of debate about physical characters can become very bad for reputation on comments on here unless it is conducted rationally)." Exactly. If people make illogical arguments to support their unwavering pointless stance, then what is the 'debate' really about? Nobody wins at that game, everyone loses. Interesting paper. The samples are from Mesolithic Haryana, 120miles from Rakhigarhi. "Collectively, North Indian Mesolithic groups are significantly taller than Eastern or Western European Mesolithic samples." - "Ancient genomes document multiple waves of migration in Southeast Asian prehistory"
does that mean iran neolithic people were very tall people? (Removed most of the ancients as rows, because there seems to be weird ancient attraction / repulsion phenomena going on with them, and the Thailand_BA and Cambodia_IA seem to be producing straight up questionable stats). Hhmmm, what do I know about Y-DNA, but I2a2a2a (I2-P78?) in Neolithic Vietnam (1700 BCE)? Is that something expected? Lol thanks for the link Matt. Usually the labs release simultaneously but it seems here one lab's hand was forced or smth. 1) The East Asian clade is bifurcated into a clade that contributes to Atayal and to the first Southeast Asian Farmers (lets use FSAF), i.e. the Mlabri- and Htin-like farmers. The other half contributes to Mixe and 10% to Dai, who otherwise is quite Southeast Asian. Quite interesting because here, northern East Asians are more related to the ENA of Native Americans than to their Southeast Asian cousins. 2) The 27%-30% of the ancestry of the FSAF that are not closely related to Ami is modeled by McColl as branching closely to MSEA HGs and as having 4-6 shared drift with Onge, but in Lipson they share 0-1 shared drift with Onge, so we need to resolve that at some point. Also for the EAs = Tianyuan + Onge, the % Tianyuan that goes into Ami in McColl varies from tree to tree (4-~30%), it seems like when the number of deg freedom is very large the trees become kinda unstable, so much for the "consensus tree" idea. 3) Lipson (2018) finds that 100% of Mlabri, 94% of the ancestry of Nicobarese, 60% ancestry in Borneo and 37% of the ancestry of Juang in India are identical to FSAF, and divide the sections into (Mlabri, Juang) and (Borneo, Nicobarese) with the FSAF sample (Vietnam Neolithic) as outgroup. Very interesting because, on the linguistic side, (Nicobarese, Mon, Aslian, Bornean substrate language), or Southern Mon-Khmer, are purported to be a clade in both of Diffloth's classifications. 75% in Naxi, >50% in Yi, Tujia, Tu, Han N China, Jinuo, Karen etc. 100% of the E Asian part of Pahari, Spiti and Kusunda belong to this component. So I was saying for some time that we are getting closer and closer to showing that Tibetoburman was also spread by some migration from the foothills of the Himalayas. Now for the Oakaie ("Myanmar LNBA") genomes in Lipson et al we see that they are FSAF + new ancestry component in EAs, and that on PCA they fall between Burmese and Naxi! Thanks for the plots. The difference between Vietnam NE (FSAF) and Myanmar LNBA (Oakaie) loads most strongly on Naxi and Chinese Han Beijing (CHB), between Myanmar LNBA and present-day Burmese is the same, while the difference between Vietnam BA (Dong Son Culture most likely, like the BA samples from MacColl) and FSAF loads most strongly on Miao, Ami and Atayal, so Lispon reflects McColl's results very well indeed. Methinks the Mesolithic Indians will come out like Native Americans, where the male uniparentals come from one parent population (H, weird F, weird C) while the mtDNA and autosome is dominated by clades related to East Asians and Oceanians, with only a minor fraction of the mtDNA of the still poorly-characterised earliest inhabitants of the subcontinent. Iran Neolithic ? lol . Wibhu Kutanan et al. (2018), "Contrasting maternal and paternal genetic variation of hunter-gatherer groups in Thailand" (Scientific Reports, volume 8, Article number: 1536, doi:10.1038/s41598-018-20020-0) was published online on January 24, 2018. The authors found that all four of their male Maniq (Austroasiatic-speaking "negrito" in southern Thailand) samples from three different sampling locations shared identical Y-chromosomes that belonged to haplogroup K.
Haplogroup K2b1-P399, whose nearest known outgroup is haplogroup P, predominates in most indigenous populations of Near Oceania (although descendants of haplogroup C1b2-B477 also have been found among them with notable frequency). In the Philippines, too, it appears that most Y-DNA that belongs neither to any generically East/Southeast Asian subclade of NO-M214 nor to any clade that plausibly may be ascribed to recent colonial influences belongs to haplogroup K2-M526 (cf. Karafet et al. 2010 & Trejaut et al. 2014). These facts should be considered before jumping to conclusions on the basis of the present study's finding of Y-DNA belonging to haplogroup C and haplogroup D in two ancient specimens associated with Hoabinhian artefacts. Even if not members of K2a-M2335, members of some subclade of haplogroup K2 must have been present in Palaeolithic Southeast Asia alongside members of haplogroups C and D.
Comparing the two (https://i.imgur.com/Mwu5oDH.png) present day Burmese samples mostly look generally loaded away all other East Asians by f3, compared to Myanmar LNBA. However I'd guess this probably reflects enrichment of ancestry from India/Bangladesh (any admixture from a deeply divergent clade hits f3 hard). Relatively speaking among East Asian groups shifts between the LNBA and recent look suggestively like they could be towards both Dai / Miao / CHB, away from Borneo / Naxi reflecting more drift from clines entering SE Asia from an Eastern direction? So yeah, tentatively this agrees with the results suggesting wider networks of admixture over time and the kind of predominant vector identified by McColl. For the Burmese case, though, I'm actually wondering if there really *was* a first MSEA farmers (FSAF / Austroasiatic) -> later farmers dynamic, autosomally speaking. It seems like Upper Burma is relatively sheltered by mountains (the Shan Plateau(?) to the east) and not really downstream of the Mekong route Austroasiatics may have followed the SE China. So I wonder if the people from what looks like it could be the Sino-Tibetan urheimat might have actually been the first to ride the Neolithic wave to Upper Burma. Even though there are obviously later subsequent, substantial migrations and any first people from a Sino-Tibetan direction weren't actually necessarily the Pyu people, who are the first recorded people whose language we have a handle on. At the same time proper Austroasiatic (FSAF) migrations enter via a route around the coast of Lower Burma, in the form of the Mons? Yeah, it look like to get that to happen, first ADMIXTURE needed to split off a Japanese-Ryukyuan component (pale green) from the generalised China-Japan-Korea component (dark green), then a Hmong dominant component linked to Southeast China (purple) which picks up some Austronesian component, all of which makes sense. The remaining southwest / Himalaya Foothills component is then the dark green Sino-Tibetan that maximizes in Naxi. I would not coincidentally, this also maximises as a % of total East Asian components in Pahari (Indo-Aryan speaking, mostly South Asian autosomally, Tibetan foothills). For the Burmese thing, I think its parsimonious to think AuAs people stretched from Vietnam to India at one point since the Mundas are found there. And also the Juang split preferentially from Mlabri in Lipson et al. Yep I noticed the Spiti, Kusunda, Pahari thing too. Honestly, once someone gets their hands on this dataset plus the HGDP, SGDP and Human Origins datasets and add Onge, Sherpa and also write to the Japanese researchers for the Ainu genomes, one can use modern-day variation to reconstruct the Tibetan HGs using allele frequency algs like ADMIXTURE, which is what the High-Altitude Adaptation paper did, and then use formal stats to prove, incontrovertibly, a contribution from diverged highlander HGs to Han N China. Would attract quite a bit of attention even if this is just blogged, methinks. RK: For the Burmese thing, I think its parsimonious to think AuAs people stretched from Vietnam to India at one point since the Mundas are found there. And also the Juang split preferentially from Mlabri in Lipson et al. Good counterpoint, though I would say that it does seem pretty consistent if the Munda/Juang groups got to India from a fairly coast hugging migration along Arakan that avoided Upper Burma, and Austroasiatic and Tibeto-Burman speaking populations may have been somewhat separate within the Burma prior to reaching India. One thing I would say about the proportions within McColl's models is that the models which find 4% Tianyuan-like have *colossal* f2 drift in the shared proto Tianyuan-East_Asian_T_Related branch, at 114 f2 units, while 32% has about 16 f2 units, and 6 f2 units in the private East_Asian_T_Related branch. Functionally, this means that in either case, Ami get about 5-7 f2 units that are not shared with the Group1+Onge clade, while Group1+Onge share about 2-3 f2 units, and then Onge goes on to have about 75-79 f2 units of private drift. Essentially, most (95%?) of the Onge drift from East Asians is private and not shared with the Group1 (Hoabinhian) samples. Why I'm thinking about the Burma case so much I guess is that so far in mainland SE Asia, you kind of have all the language change really within history: the initial Austroasiatic SE Neolithic picks up ancestry from groups migrating from SE China after the Neolithic, but none of this catalzyes any language change until the expansion of the Tai-Kadai languages to Siam and Laos and the emerge of polities centered around their speakers (e.g. prior to this point the region Austroasiatic speaking and presumably migrants ultimately adopted language and were absorbed into groups). All the change is within history and fairly easily explicable. We know there was a wider Austroasiatic speaking region, and we understand its regress due to expansion of Tai-Kadai. But in Upper Burma we only really have the first language as Pyu, a Tibeto-Burman variant, and we don't really know when Tibeto-Burman / Sino-Tibetan began expanding. Could have been Neolithic - if the group started in Himalayan foothills and reached North China, it had to do so by at least 1200BC (3200 YBP) when we first Chinese inscriptions, and clearly it would seem like it should have been evolving separately from of languages in the group by that point, one way or another. One estimate of divergence time within group for Tibeto-Burman / Sino-Tibetan is 4000 YBP (to reach estimated divergences). Even the oldest Neolithic MSEA Asian samples that are plausibly representative of an Austroasiatic wave of migration are about 4100 YBP. 4) we now have genetic data showing that the first farmers everywhere roughly formed a clade (barring local HG admixture). 4) we only have early Neolithic samples really in Vietnam. Putting tgt McColl and Lipson together, we see that MSAF reached Laos and peninsular Malaysia (granted the Laotian samples are very close to Vietnam) and their ancestry is widespread throughout all of MSEA and Sunda and is overprinted by different other ancestries in different places(AuN in island SEA, ST in Burmese, Tai in Eastern Mekong RV and Vietnam) leaving outliers like Nicobarese, Orang Asli, Htin and Mlabri and to a lesser extent Proto-Malays like Bidayuh and Semende. To me, this suggests an earlier spread of FSAF compared to Dai, ST or AuN ancestry. Since they appear fully formed in SEA this also implies AuAs ultimate origin somewhere in S China, i.e. Nicobarese like people on the banks of Yangtze (quite difficult to imagine) and the origin of the AuN, Hmong-Mien and ST gene pools even further north than is usually assumed, maybe even North of the Yangtze. I agree 6kya beginning of spread for both ST and AuAs is weird, but originally the ages suggested were much older for AuAs, 8kya had been suggested, and there is a trend towards younger and younger ages more recently, like 4kya for Blench which seems clearly wrong to me (divergence btw AuAs branches clearly much more than among IE). Case of "revisionist acceleration" among younger and younger scholars I think. ST is also intrusive to the region, both genetics-wise (the original Myanmar LNBA were more Naxi than Burmese, implying admixture with locals and prior external origin) and linguistics wise, where the centre of gravity of the phylum likes in the region from Meghalaya to Sichuan. So circumstantial evidence suggest ST overprinting AuAs to me. Looking at the AuAs presence in Yunnan-Burma-Thailand trifecta among ppl like Palaung and Wa, and their closeness to Thai AuAs, it may be that that region was 100% FSAF at some point too. "(Whatever disputes about likely phenotype, the ASI (pre-Neolithic) were likely extremely short, extremely dark, extremely broad featured, beyond any present day populations, whether they had a more gracile cranial phenotype on top of that like the Onge or were more robust like Oceanians. Almost everything from present day information on populations from hot climates and our knowledge of clines of phenotype in India today supports this)." You are right about ASI having some level of genetic relation with the Onge and them being somewhat gracile. With that said, there was probably much variation in the height of south asian hunters, with shorter hunters to be found elseware. Also there's precaution to be taken when relating ancient populatons with today’s climate. For example, note that mid Holocene India was more hyper arid and desert-like than it is today. Really all the evidence for language dispersal here is leaving me more and more confused; I was reading some of Blench yesterday to try and get a handle on the topic and he seems fairly vehement that the dispersal of the whole TB language clade had to have begun approx 8-9kya, and that Sinitic had to expand 4kya, to get to the diversity seen among TB from NE India to China, and among Sinitic languages. Though will say he disagrees about the presence of agriculture in earliest strata of TB expansion, and does seem to favour a later expansion of TB languages into Myanmar itself (and generally in agreement with Pyu speakers as intrusive over preceding AusAs groups). All I can really take from him in brief, is I think there's a consensus the whole TB clade has to be expanding earlier than Austroasiatic (based on internal diversity) and terminology does not too much favour a late expansion? Anyway, so you'd guess some of this is underestimation of the spread of the Neolithic and AuAus in MSEA? Otherwise Austronesian, Austroasiatic, Sinitic expansions happening at more or less similar time. I will probably have to play it conservative with dates here, but will keep listening out to see if adna or other evidence trumps the models of language diversity and the dates that are currently in play... (Really some kind of direct adna of the Austroasiatic signature from well prior 2ky to Man Bac would do it fairly decisively). I won't be too shockedif you are ultimately right! Or, they *were* the locals and admixture with Austroasiatic populations who had migrated in along the southern route had yet to become as a major a thing as by the present day (interactions between TB speaking northern polities and Mon speaking polities in the south later in history?). A la Lithuanians today being more tilted to EEF than Baltic_BA or the other populations that preceded them ever were, because of continuing isolation-by-distance contacts with Central Europe. (If anything I'm more surprised by how linear the f3 correlation to East Asian groups seems to be between the Myanmar LN to BA pair and present day Burmese. The relative shift also looks a bit like Burmese are shifting towards Austronesians and SE China, than actually too much like a straight story of absoprtion of Austroasiatic groups. That is Nicobarese and Borneans also subtly above the line for relatedness of Myanmar_LNBA relative to Burmese. From sticking a few of these stats through PCA: https://i.imgur.com/OFPQzN6.png. What is the explanation regarding Y-DNA I2a2a2a in 1700 BC Vietnam? a Typo?. "On the "wheel" between relatedness to the EA groups from Myanmar_LNBA to Cambodian from Naxi->Nicobarese, Burmese about 70-80% loaded towards Myanmar LNBA... Then on a PCA wheel where one end reflects Myanmar_LNBA and Cambodian having more affinity to Nicobarese and Naxi relative to Ami, and KHV being more loaded to Ami on the other end, Burmese about intermediate. Burmese look like they're shifting mostly towards populations entering SE Asia from SE China? More than further AusAs absorption?)" The Tai people have expanded probably from roughly the watershed of the Pearl River beginning probably at some time in the first millennium CE into northern Vietnam, Laos, Thailand, southern Yunnan, Upper Burma, and Assam. Could intermarriage between Burmese and Tai people over the last millennium or so have been significant enough to effect a shift of Burmese autosomes toward populations of southeastern China and Taiwan? If such an influence has occurred, it does not seem to be well-attested in the Y-DNA of present-day Bamar judging from the samples of Min-Sheng Peng et al. (2013), but that would not necessarily disprove such a hypothesis because most of the gene flow could have been mediated by Tai women marrying into the Burmese population. "I agree 6kya beginning of spread for both ST and AuAs is weird, but originally the ages suggested were much older for AuAs, 8kya had been suggested, and there is a trend towards younger and younger ages more recently, like 4kya for Blench which seems clearly wrong to me (divergence btw AuAs branches clearly much more than among IE)." I concur. There is very little shared in common among all languages that have been grouped together according to the hypothesis of an Austroasiatic language family that really screams "singular genetic origin," especially when compared to the obvious similarities among Indo-European languages. Some of the terms that do appear at least superficially to be patent cognates (something like tay for "hand" or something like mat for "eye") are frankly very similar to words in other languages of coastal Eastern Eurasia (Austronesian, Japonic, Ainu, etc. ), so I wonder how rigorous proponents of the Austroasiatic hypothesis have been in their identification of sound laws and exclusion of the possibility of loanwords or Wanderwörter. Okay the I2a2a2a is a typo , from a reliable source I am informed that it is actually O1b1a . Ebizur, i hope no one will take a sample of 2 as representative of all pre-Neolithic Southeast Asian Y DNA. :D F2-M427 should also have been around there. i gather there is quite a bit of this kind of deep lexical sharing between East Asian languages, which would not suprise us if they all started out in Neolithic China, where there is supposedly an interaction sphere reaching from well south of the Yangtze to north of the Yellow River considerably pre-dating these Neolithic MSEA samples. One thing to note is those people who think Sino-Tibetan is more of a "trans-himalayan" language family like van Driem and Blench, also tend to think that the tribes of Meghalaya and the Indian side of the Himalayas in general contain the most divergent ST languages and place Lolo-Burmese, Karen, Bodic (tibetan and related) and Sinitic, i.e. all the Eastern, more extensive branches of ST as part of a single terminal branch that represents the most successful eastern scion of the family, so their dates likely have to do with the deeply diverged stuff in trans-himalaya region, with a later, more conventional date for the extensive eastern branches of ST. Personally unqualified to comment on the validity of this proposal, a bit skeptical because trans-himalaya region is just the sorta region to develop diversity-sparing effects (like the Caucasus) or substrate effects (c.f. highland east Asian HG autosomal signature preserved in Sherpa), and it seems lowland east asian contribution from agropastorals is ubiquitous even west of the Himalayas, including ppl like Kiratas, only ppl who don't have it are the Sherpa. So Kinh Vietnamese speak AA langiage but genetically they are Tai-Kadai? By the bronze age, this area of Northern Vietnam may have been Kra speaking (See 'Kra-Dai and the Proto-History of South China and Vietnam - James R. Chamberlain'). It is before the expansion of Kinh into the area, so the Kinh must have absorbed the former populations as they expanded their civilization. Unreal. I was resigned to waiting for the Indo-European subject matter to be finally over and done with, and therefore expecting South and Central Asia and thereafter China to be covered, long before Southeast Asia would finally get a turn. Now 2 papers on Southeast Asia aDNA have landed, with nearly 40 samples in all. Spectacular. Good I came to check here before beginning my reading, after seeing the Y-DNA I2a2a2a mention on anthrogenica. Someone there reasoned it may have been mistyped, with O intended for I, while another said he'd notified the authors' about it. Thanks Nirjhar for confirming it was in error. So that is the reason why i am curious about the closeness between Dai and Kinh people. Are they really close by Fst? "So Kinh Vietnamese speak AA langiage but genetically they are Tai-Kadai?" Tai-Kadai is a language family, so it is not really correct to say that Kinh people are genetically Tai-Kadai. In connection with my previous comment about the Burmese, the Tai Khuen and the Shan should be most relevant as potential vectors of SE Chinese-like DNA into Burma at some time within the last two millennia. O1b1a1a2-CTS350 (formed 10700 ybp; TMRCA unknown) Found in two Han individuals from Hunan in the CHS sample of the 1000 Genomes Project. Note that the CHS Han from Hunan have a very aberrant Y-DNA pool, and may not be "authentic" Han Chinese, but rather mainly descendants of some originally non-Chinese ethnic group that has been linguistically assimilated by the Chinese. This is the most basal known branch of O-M95 by a small margin. O1b1a1a1b-F789/M1283 (formed 10300 ybp, TMRCA 5800 ybp) This branch of O-M95 has been found in populations ranging from the Dravidian-speaking Gond and Konda Dora and Munda-speaking Ho in the west to the Austronesian-speaking Lebbo and Dusun of Borneo in the east. It also has been found in three Kinh, three Dai in Yunnan, a Yi, and a Cambodian. 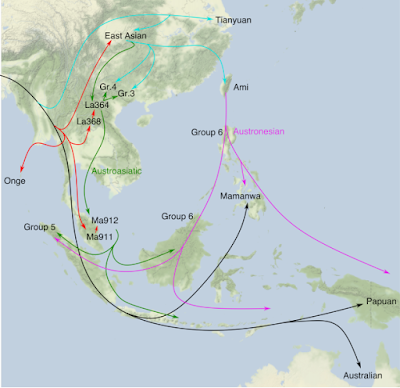 Members of this clade seem most likely to have been responsible for effecting a linguistic connection between Munda-speaking peoples in India and other Austroasiatic populations in Southeast Asia. O1b1a1a1a2-SK1630 (formed 9900 ybp, TMRCA unknown) This is a poorly known branch of O-M95 that has been observed in an individual with a patrilineal ancestor from Ryazan Oblast of Russia, just southeast of Moscow Oblast. O1b1a1a1a1b1a-CTS7399 (formed 9900 ybp, TMRCA 5600 ybp) This subclade has been observed in a Japanese in Tokyo, an individual from Fujian, two Dai in Xishuangbanna, and an individual from Guangxi. The Japanese individual is basal to a branch that includes all the members from China; the South China branch has an estimated TMRCA of 3500 ybp. O1b1a1a1a1b1b-CTS5267 (formed 9900 ybp, TMRCA unknown) This subclade has been observed in one Han in Beijing and four Dai in Xishuangbanna. O1b1a1a1a1b2-Z23781 (formed 9900 ybp, TMRCA 8500 ybp) This subclade has been observed in an individual from Henan, an individual from Chongqing, and two Dai from Xishuangbanna, with the individual from Henan being basal to a branch that includes the other three individuals. Note the rather great TMRCA. Haplogroup O1b1a1a1a1a-M111/M88 (formed 9900 ybp, TMRCA 5700 ybp) Members of this subclade are very common among modern Tai peoples, Kinh, and Akha-Hani peoples. They also have been observed with lower frequency among other Lolo-Burmese peoples, Qiangic peoples (e.g. 1/33 Qiang in the sample of Xue et al. 2006, 2/18 Horpa from Danba County, Sichuan), Tibetans (1/47 Khampa from Hekou Town, Yajiang County, Garze Tibetan Autonomous Prefecture, Sichuan), Kam-Sui peoples (e.g. 1/40 Sui from Fuyuan, Yunnan according to Yang et al. 2005, 1/21 Chadong), Hlai people (1/11 Hlai according to Li Dongna et al. 2010, 1/34 Li according to Xue et al. 2006), Hmong-Mien peoples, Tujia, Bai, southern Han, and Austronesians in Taiwan, the Philippines, Malaysia, Vietnam (i.e. Cham), Java, and Borneo. This subclade notably has not been found among speakers of Austroasiatic languages in India, but Li Dongna et al. 2010 have reported finding O-M88 in 3/26 = 11.5% of a sample of Cambodians and Cai et al. 2011 have reported finding O-M88 in various Austroasiatic-speaking populations in Laos. In summary, there is one branch of O-M95 spread all over southern Asia from India to Borneo, one branch spread mainly in southern China, Vietnam, Laos, and Thailand, one branch split between southern China and Japan, one branch split between Beijing Han and Yunnan Dai, one branch split between roughly central China and Yunnan Dai, one branch in Russia, and one branch in Hunan, with the branch in Hunan being the most basal by a slight margin. The founder of O-M95 as a whole most likely has not lived any more recently than the earliest Neolithic culture in East Asia, but he probably does not predate the earliest Neolithic in East Asia by a great margin, either. Thanks for bringing the paper to my attention. I'm once again not qualified to evaluate the argument, but I've gotta say that the idea that the red river valley was not Vietic at the beginning sounds unusual and exotic to me and I've not read anywhere, either in sources on Vietnamese protohistory or AuAs linguistics, that vietic peoples were intrusive to the Vietnamese heartland (then again you won't find this argument for Sinitics either until very recently, so the reluctance to recognize non-autochthonous origin in East Asia may just be cultural inertia Am on East Asians that then got diffused to Western linguists studying the languages). Certainly a Tai-Kradai intrusion in the Red River valley that only got overlaid by a Vietic linguistic shift spreading North close to the second mil AD would explain why Vietnamese are so similar to Tais autosomally. (Phiaeu) Vietnamese look autosomally like Cambodian+Zhuang, which is virtually identical to Tai speakers in mainland SE Asia, in fact Northern Vietnamese are if anything even more Tai-shifted than Thais themselves. The Dong-son culture remains we have in McColl cluster with present day Thais and Laos, and slightly south of present-day day Viets, i.e. slightly more more Cambodian (or AuAs) like. But then a Tai-Kradai speaking Red River Valley must be a postNeolithic development as well, as the Neolithic genomes we have here show quite clearly that the Neolithic inhabitants of Vietnam, all fall in "group 2" and all cluster with Mlabri, Orang Asli and Nicobarese. If we accept the congruence of genes and languages in SEA, which I think we generally should given what this paper has shown, a three-layer linguistic sandwich, with the Tai-kradai in the middle from the Bronze Age to the 1st mill CE, may be closer to the truth. What do you make of the paper Garvan has introduced? Just out of my own curiosity, where is the most likely place of origin for O? It seems like most have speculated Southeast Asia however it seems like O branches came from farther north in China during the Neolithic judging from this paper however I have little knowledge on this subject. there is also Phan's theory that the Red River plain spoke a Middle Chinese dialect (Assamese Middle Chinese as he calls it in his thesis "Lacquered Words") and shifted to Vietic at a later point, explaining the very high Sinitic content in Vietnamese (parallel to Norman French in English). but the region may have been Vietic before that anyway. @Ebizur: Could intermarriage between Burmese and Tai people over the last millennium or so have been significant enough to effect a shift of Burmese autosomes toward populations of southeastern China and Taiwan? This certainly seems like a fairly possible theory. The other thing which occured to me shortly after my initial post (and I forgot to post at the time) was that the original Bamar themselves were a later intrusion from Yunnan and so may have carried a little offset towards groups from the Southeast Chinese Neolithic (Hmong / Austronesian like). Assuming generally widening admixture networks over time in the region. That is Bamar migration may not just be a "more Tibeto-Burman / Sino-Tibetan" into a Myanmar_LNBA substrate. In support, the Naxi do have a slight offset towards Ami, Dai, Miao, Lahu and Burmese, but away from Nicobarese and equal to CHB, compared to the Myanmar_LBNA: https://imgur.com/a/XR1Zs (e.g. compared to Myanmar_LNBA, Naxi are more SE China like, less Austroasiatic like, same distance to North China). So it could be both effects, though I think your effect might be more plausibly dominant as it would require less admixture fraction to the same ends. Did authors run the ADMIXTURE of the above populations? The Dai and Kinh look like Southern Chinese in Admixture graphs. Have a look at the f statistics at the end of the 'Ancient genomes document multiple waves of migration in Southeast Asian prehistory' paper. These show shared drift between pairs of populations. We can clearly distinguish Dai and Kinh (KHV), with the Dai having more shared drift with Hmong, Lahu, Htin. The Kinh have more shared drift with Han. "These results, together with the absence of significant Denisovan ancestry in these populations, suggest that the Denisovan admixture observed in Papuans occurred after their ancestors split from the ancestors of the Onge, Jehai and the ancient Hoabinhians. This is also consistent with the presence of substantial Denisovan admixture in the Mamanwa from the Philippines, which are best modeled as resulting from an admixture between Austronesians and Papuans, not Onge"
Given the proposed migration routes in the graphic copied above, where can the Denisovan admixture have taken place? Since the Reich paper in 2011 - looking at figure 3 in this paper showing the Denisovan admixture in the Mamanwa - I have thought the migration route for the Denisovan admixed population was from China via Taiwan and the Philippines. Yes, I know they would need boats. "What do you make of the paper Garvan has introduced?" I did not find anything very conclusive. The most memorable aspect of the paper IMHO is the author's claim that Southwestern Tai peoples use cognates of Kra to refer to some "hill tribes" in their vicinity, many of whom natively speak one or another Austroasiatic language, and that Kra is cognate with 楚 Chǔ of classical Chinese texts. We really need more ancient DNA from various parts of the PRC. "Just out of my own curiosity, where is the most likely place of origin for O?" Personally, I would say the most likely place of origin of haplogroup O is 中原 (the "central plains," roughly the flatlands of "China proper"). O1a-M119 (formed 30100 ybp, TMRCA 15200 ybp) may have matured in the southeastern portion of this area (roughly the YRD), eventually spreading southward mainly along the coast and into Taiwan at some time in the fourth millennium BCE. Much of the subsequent distribution of the haplogroup probably has been effected by the spread of peoples speaking Austronesian languages. O1b1a2-Page59 (formed 22100 ybp, TMRCA 15900 ybp) seems to be comprised of three primary subclades, all of which may have been spread by Chinese people proper. (The Cao clan of Wei appears to belong to one of these subclades.) However, one of the three subclades, O1b1a2b-F417, is deeply bifurcated (TMRCA 11300 ybp). The O1b1a2b1-F840 branch has been found in Han Chinese and a Dai. Members of the other branch of O1b1a2b-F417 have been found so far only with very low frequency among Koreans and Japanese IIRC. O1b1a1-PK4 (formed 22100 ybp, TMRCA 12400 ybp) appears most likely to have populated some part of the watershed of the Yangtze River, perhaps around its middle reaches (e.g. the Chu/Jingzhou/Huguang area), in the early Neolithic. It appears that one branch of this population (probably O1b1a1a1b-M1283: formed 10300 ybp, TMRCA 5800 ybp) eventually moved south to found one of the earliest Neolithic cultures (perhaps the very earliest) in mainland Southeast Asia. The O1b1a1a1a1b-CTS5854 subclade appears to be less bottlenecked, probably because it occupies more-or-less the ancestral Neolithic homeland of the O-PK4 clade, although many members may also have spread southwestward quite recently in tandem with the expansion of the Tai people. The O1b1a1a1a1a-M111 subclade (formed 9900 ybp, TMRCA 5700 ybp) may have started to spread into Southeast Asia around the same time as O1b1a1a1b-M1283, or it may have remained somewhere in southern China until a more recent era; I think this question cannot be resolved without more data from ancient DNA. It seems to be found at present mainly among Tais and Viets, but it is also found among the Bunun tribe in Taiwan and in the Philippines, so some branch of it may have spread via the coast of southern China. O1b2-M176 (formed 28400 ybp, TMRCA 12100 ybp) is now found mainly in Japan and Korea, but a few cases have been reported in samples from southeastern Siberia, Manchuria, Mongolia, Xinjiang, Khams, China proper, Taiwan, and Vietnam. It is difficult to discern where it might have originated; perhaps southern Liaoning? O2-M122 (formed 31500 ybp, TMRCA 29000 ybp) is phylogeographically a mess. I suppose O2a2b2a2b-AM01847/B451 probably has spread southward along the eastern coast of China together with O1a-M119 and subsequently dispersed widely with speakers of Austronesian languages. O2a2b1a1a6-CTS1642 (formed 8200 ybp, TMRCA 6200 ybp) may have expanded along with the spread of the proto-Tibeto-Burman language. O2a2a-M188 (formed 24600 ybp, TMRCA 20900 ybp) appears to be very old, and it may have populated some part of central or southern China prior to the Neolithic revolution; one branch of it is now common among speakers of Hmong-Mien languages. The other subclades (O2a1c-JST002611, O2a2b1a2-F114, etc.) seem to be spread all over East Asia (and into Southeast Asia and Central Asia) with some variation in the density of their distribution, but no really clear-cut pattern. I think this is ascribable to their having been present in the populations of the earliest Chinese states or assimilated into the nascent Chinese polities at a very early stage of their development, so that members of the various subclades have been moving around within the Chinese realm and gradually forming a sort of homogeneous suspension (and also relocating together wherever Chinese emigrants have settled). Just noticed I got your name wrong, apologies. Thanks for taking the time to read the paper man. Your answer about Haplogroup O is honestly the most useful thing I've read in the comments section in a while! Kudos! Have you considered setting up a blog? Your systematic knowledge of East Asian uniparentals, if it were recorded somewhere, would be a great reference for many people. Judging from the spread of the FSAF from the Nicobar islands and (I'm assuming pre-MLBA) Burma to the Red River valley in Vietnam, what do you make of the implications for the Austroasiatic homeland? What do you make of the uniparentals of FSAF, which seem to be stereotypically "Austroasiatic" clades of O? What about the uniparentals for the Dongson sample and the fact that this YHap intruded with a combination of "Hmong-Mien" and "Austronesian" (i.e. Tai-Kradai-like) ancestry? The FSAF definitely had fully-fledged rice agriculture from the archaeology, what do you make of the reconstructions that deny proto-Austroasiatic the privilege of being the linguistic stock with the first rice-farming vocab, and reconstruct it with a light horticultural vocab centering on Taro, yams etc? Lastly you mentioned on AG that ~1/3 to 1/4 of Koreans and Japanese carry clades of O coalescing with mainland East Asian clades in a "recent" (i.e. Neolithic and post-Neolithic) timeframe. Could you talk about some of these clades, how deeply they coalesce with clades in Continental East Asia, and if they indicate population movements or splits at the Neolithic, Metal-Age/Protohistoric, or historic periods in Korea and Japan? Hope that you could at least answer the last question if you don't wanna answer all of them. If you are still reading, I think you can learn some things from Ebizur. I really appreciate what you are doing (i'm sure many do), but there has to be a scholarly method to it. Keeping track of references, systematising, such that you can back yourself up with example uniparental clades whenever you make an argument for a certain pattern and then reference all the way back to the lab, sample and paper when necessary, etc. Not only subclades of O2-M122, but also subclades of C2-M217 are clearly shared among Chinese and Koreans more recently than the onset of the Neolithic in China. Sharing of O1a-M119 in a similar manner appears likely. O1b2a1a-F3356 is extremely frequent among Japanese and Korean males, but it is quite uncommon (< 1%) among Chinese males; however, the TMRCA of the entire clade seems to post-date the onset of the Neolithic in China, so it hypothetically could have derived from a Chinese Neolithic ancestor, although it is phylogenetically very deeply divergent from all other extant subclades of O-M175. High-resolution data regarding other Y-DNA clades found among modern Koreans (foremost among them being N-M231, to which about 4% of Korean males belong, but also D1b-M55, Q-M242, R-M207, J1-M267, L-M20, C-M130(xM105, M38, M217), etc.) is lacking, but I would not be surprised if most of them turned out to be related to Chinese (especially members of N-M231, Q-M242, and C-M130(xM105, M38, M217)) or Japanese (especially members of D1b-M55) at a similarly shallow chronological depth. 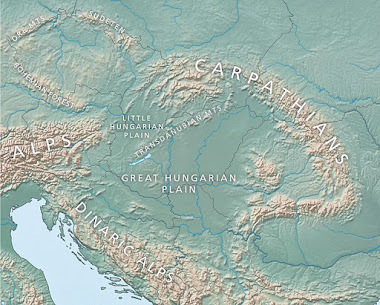 Also, an erratum: I posted that the MRCA of NO-M214 must have had a patrilineal relative who migrated as far as southwestern Romania (i.e. Peștera cu Oase) approximately 5,000 years earlier, but this should have been approximately 9,000 years earlier. Perhaps ancient DNA from Palaeolithic Eurasian specimens might allow scientists to elucidate the migration routes of early members of Y-DNA haplogroup K2a, including the MRCA of NO-M214 and his close kin. Ebizur, thank you so much for this data! Unfortunately, these clades fall within the timeframe of the East Asian Neolithic but there is no clear indication if they coalesce even later than that, except for a few clades. It doesn't seem we know these clades at high enough resolution to tell us when the period of gene flow was. Would you say that, so far, the most we can say is that the autosomal connection was due to some post-neolithic rice-farming migration from somewhere on Continental East Asia to Korea and Japan, and other than this we do not know if there was further gene flow in the protohistoric or historic periods from the uniparentals? I agree that the only conclusion that can be stated definitively at the current level of resolution is that significant percentages of Chinese, Vietnamese, Koreans, and Japanese (and other populations, too, such as Mongols and Thais) share common patrilineal ancestors at some time more recent than the oldest archaeologically attested Neolithic cultures in East Asia, e.g. Nanzhuangtou in North China and Pengtoushan in South-Central China. The precise number, timing, and direction of the episode or episodes of gene flow cannot yet be determined. For example, in the case of the O-CTS2815 subclade of O-F444, the MRCA of the Korean and the Han individuals from Beijing and Henan may have lived as early as 9000 years ago, quite early in the Neolithic. However, the Korean is basal to a subclade that includes an individual from Hunan, China, an individual from Tokyo, Japan, and an individual from Ho Chi Minh City, Vietnam, and the MRCA of the Korean individual and the three members of that subclade is estimated to have lived sometime between 2200 and 5000 years ago. One's interpretation of this phylogeny in its current poor level of detail in relation to geography or ethnic history depends a great deal upon whether one might allow a post-Neolithic migration from the pre-Koreans to the pre-Chinese(/Vietnamese/Japanese), or whether the direction of gene flow is always assumed to be from China to the rest. If the latter, then the gene flow from China to Korea and especially that to Vietnam and Japan must be quite recent indeed, perhaps in the historical era.